Latest News: The new album is now available for order via the link on the sidebar, or the album page. You can also find samples of all the songs on the cd there, as well as the first 4 tracks in their entirety. Mons’ Tunes is a music blog dedicated to hosting/promoting my own original music. I also regularly update the site with other artists and songs that I really enjoy. Think of it as the official “Mons” artist page as well as a music recommendation blog. Samples from, and information about, the brand new self-titled album (released October 31st) can be found on the album page. You can find more of my music in the Reverbnation widget on the right hand side of the page and on the “My Music” page (which also features music not available through the widget). Please leave comments and suggestions about the music and website (via the little speech bubble at the bottom of each post). For past suggestions, check out the recommendation archive. Thanks for visiting monstunes! My very talented brother Konrad has crafted a video for Cascade, from my self-titled album. It consists of footage he took in and around Vancouver several years ago. I think this is my very first music video, so it’s quite exciting! I think it fits the music quite well. Honestly, I’m not sure what I would have come up with, had I decided to do a video myself. It’s always really interesting to see what sorts of images my music creates within the imaginations of others. I have been woefully neglectful of my site since the release of my album last year. Life has a bad habit of getting in the way of that which is truly important (which is updating this website, obviously). However, just because I’ve been doing a poor job of marketing my own music doesn’t mean that I haven’t been writing and recording! I am continually playing around and composing. Pretty sure that the day I stop is the day I turn back into the stardust which originally formed me. As a few of my favourite astrophysicists have pointed out, the matter from which we are made came into being in the hearts of stars, and was spread through the universe by supernovae. So, the kiss of life which gave us all breath was actually the violent deaths of uncountable stars, billions of years ago. They died so that we might live. One might say that the music I create similarly is the product of a supernova. I certainly can’t take the full credit. So in that theme, this song is tentatively dubbed “Starkiss”. Maybe it refers to romantic nights spent under the stars, or perhaps it refers to the violent supernovae which put us all here in the first place. You decide. It’s not a complete song. Rather, it’s just a rough recording of me rambling around on the keyboard in the middle of the night. It will probably find its way onto some sort of official recording eventually, since I love to play it. This is its first incarnation. I will record and post the current version that I’m playing around with these days by and by. As always, you can hear more of my music (including samples from my latest album) on my music page. Welcome back! It’s been a long time since I actually updated the MSMOTD. It was derailed initially because of the production and release of my album, and then continually postponed due to academic responsibilities. However, it is now back and will hopefully be updated regularly! One of my first MSMOTDs was BT’s “Antikythera Mechanism”, from his award winning and brilliant glitch-symphony “This Binary Universe”. However, as incredible as that album is, it is really just one facet of Brian Transeau’s musical taste and ability. He began as a trance/house producer and has been continually building on that base. TBU was a fairly radical departure, but his new album “These Hopeful Machines” (do I sense a theme?) brings everything full circle and combines the new techniques and style he employed on TBU with his older dance and ballad sensibilities. It’s a huge double album, ranging from full-on house meant for the dance floor, to TBU-style electronica, to glitchy alternative and beyond. I’ve been waiting 4 years for this album and while it’s not TBU part 2 (perhaps still forthcoming), I am well pleased. So are other reviewers it seems, with wired.com giving it a 9 out of 10 and saying “If you’ve never liked electronica before, this is the release that could change your mind.” High praise indeed. BT is is a very prolific writer and this album is a great showcase of that talent, while remaining quite cohesive. I actually heard Every Other Way first as a remix by Armin Van Buuren (see below) on Universal Religion 4, a fantastic trance mix album released by Van Buuren in 2009. It’s a fantastic remix, but it didn’t really prepare me for the album version. Every Other Way (featuring vocalist “Jes”) is an ethereal, beautiful and glitchy ballad which flows between soaring melodies and glitchy breaks which dig into the centre of the earth. Clocking in at over 11 minutes, it’s an epic journey, but one I keep taking over and over again, savouring every note from the opening chimes to the electronic wash at the end. Nobody else writes music quite like this, and that’s one reason why I love BT so much. This music is, in my opinion, immediately accessible and pleasant to the ear, but also pushes boundaries and experiments with sound in new ways. What wizardry he uses to craft such raw emotion from electronic audio stuttering is beyond the ken of man (at least this man), but however he does it, it definitely pushes all my buttons. I love the album version, but you can also find the radio edit (not as good) on youtube. As one of the top house/electronica/dance producers in the world, BT’s releases are remixed over and over again, as indicated by the AVB remix of Every Other Way. A number of other songs from “These Hopeful Machines” have also been remixed, including the first single (and one of my favourites from the album), Suddenly. Suddenly is actually the first track on the album, and is a much more upbeat and dancy tune than Every Other Way. With BT himself on vocals, the original track is a fantastic melding of BT’s signature house sound and a harsher alterna-rock vibe, all brought together with robotic precision by BT’s production and trademark stuttering glitches (how I love thee!). However, he’s also released the song as a single along with a bunch of other remixes, including one by the all-powerful Klayton Scott (aka Celldweller – check out the Celldweller MSMOTD)! His version is even more glitchy than BT’s original production (if that’s possible), and adds a dirty industrial sheen to the song which really changes its character. Great driving music, if you plan on weaving in and out of traffic at high speeds with no regard for human life. The video is embedded below. Lastly, I’ve included one of my other favourites from the album, the complex and brooding Le Nocturne De Lumiere. This song is for all of those who adored “This Binary Universe”. The first half of the song features a dark and throbbing beat, surrounded by a dense cloud of dreamy, stuttering accents and melodies which really have to be experienced with good headphones. The second half deconstructs the beat and breaks the melody open into a shimmering wash of sound which is then built back up into the main theme. This song is the definition of “intelligent dance music”: unique, non-repetitive, experimental and interesting, but still inherently danceable, beautiful and easy to listen to. 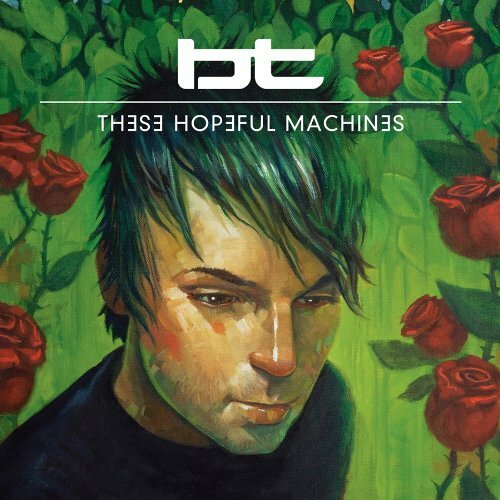 Fortunately there are several other tracks like it on “These Hopeful Machines” for those of us who really want more of TBU. BT is one of the only artists who can successfully mix crunchy house beats and breaks with vast, dreamy soundscapes which simultaneously soothe and energize. While this album is no TBU part 2 (despite songs like The Rose of Jericho and Le Nocturne De Lumiere), it is an incredible work in its own right and is one of the best albums of the year so far. BT’s myspace page (see below) has a number of other songs from the album, so definitely go check them out and then buy this album if you like it. Hope people still check the page from time to time, and enjoy the new music I’ll be posting in the near future. Support BT (and me!) by clicking these links to buy “These Hopeful Machines (Amazon MP3 Exclusive Version) ” or “the physical cd of These Hopeful Machines ” from Amazon.com! See the “buy this song” links above to get the MP3s for the individual songs I’ve included in the post.